Citation Information: J Clin Invest. 2012;122(8):2955-2966. https://doi.org/10.1172/JCI43354. Mutations that activate the fms-like tyrosine kinase 3 (FLT3) receptor are among the most prevalent mutations in acute myeloid leukemias. The oncogenic role of FLT3 mutants has been attributed to the abnormal activation of several downstream signaling pathways, such as STAT3, STAT5, ERK1/2, and AKT. Here, we discovered that the cyclin-dependent kinase 1 (CDK1) pathway is also affected by internal tandem duplication mutations in FLT3. Moreover, we also identified C/EBPα, a granulopoiesis-promoting transcription factor, as a substrate for CDK1. We further demonstrated that CDK1 phosphorylates C/EBPα on serine 21, which inhibits its differentiation-inducing function. Importantly, we found that inhibition of CDK1 activity relieves the differentiation block in cell lines with mutated FLT3 as well as in primary patient–derived peripheral blood samples. Clinical trials with CDK1 inhibitors are currently under way for various malignancies. Our data strongly suggest that targeting the CDK1 pathway might be applied in the treatment of FLT3ITD mutant leukemias, especially those resistant to FLT3 inhibitor therapies. 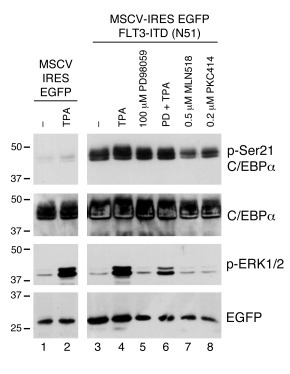 FLT3ITD can induce phosphorylation of C/EBPα on serine 21 by a non-ERK1/2 pathway. 293T cells were transiently cotransfected with a C/EBPα expression vector together with an empty MSCV-IRES-EGFP vector (lanes 1 and 2) or MSCV-IRES-EGFP–expressing FLT3ITD mutant N51 (lanes 3–8). Whole-cell extracts were analyzed by Western blot. The same membrane was stained sequentially with antibodies indicated to the right. Samples shown in lanes 1 and 3 were left untreated. Cells were also treated with TPA for 15 minutes to activate the ERK1/2 pathway (lanes 2 and 4) in the absence or presence (lane 6) of the MEK1/2 inhibitor PD98059. Lanes 7 and 8 contain samples of cells treated with FLT3 inhibitors, MLN518 and PKC412, respectively. All samples shown were analyzed on the same blot.